I've just returned from a fabulous short vacation with Mr E to Chile and Argentina! Holly Molly it was intense, but brilliant fun. 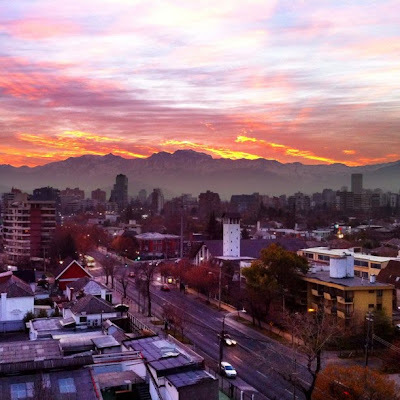 Short, as we had a about 4 days for each capital city only; Santiago and Buenos Aires. Why so short? Mr E was invited to talk at the Interactive Advertising Bureau (iab) 2011 conference and we decided we'd try and make the most of it and make it our big vacation for the year. Right now I'm pretty jet lagged, and fighting to stay away and write coherently. And with the daunting task of editing down over 2.5GB's of photos (eek!) I'll posts more over the following days. I'll leave with the first glimpse of Chile in the morning from our hotel room, around 6am, as the sun begins to poke it's head up above the Andes. Nice photo, Mr E!